Have FUN with MikuMikuDance! How do I have fun with MMD? What’s easy to do with MikuMikuDance? How do I get started with MMD? MikuMikuDance IS fun to play with. Sure, you can get serious about it and work to achieve some kind of a “work of art”… but, if you just play with it, MMD can make you smile. … and you will find LOTS of videos with motion download links. … and PLAY with ’em! Don’t worry about male/female or right model for that particular motion file… just plug in some of your favorite models… or maybe try-out models you haven’t used since you downloaded them… Load the model, load the MOTION file… click PLAY and enjoy. In that animated GIF, above, I used Kisaragi Chihaya Gothic Princess ver1-5.pmd, a model I downloaded years ago and never “used” in an animation. (I’d share her download link, but her dA page is no longer online… sorry!) That motion file is the Michael Jackson “Smooth Criminal” motion… and so, should have an MJ model… and you would bust-out laughing if you could see my Princess dance the whole 9900 frames… it’s really fun. MJ would reach up to straighten his hat, but, instead, our Gothic Princess reaches up to… straighten her flying hair… it works! … That motion is very nice… some portions of it are VERY MJ-like… fun to watch Chiyaha actually striking those almost “trademarked” MJ poses! Go get e’m… they are free and fun. Some of those are “making of…” articles where our writers share their insights into the videos they have made… but many of those are “projects” that include download links for the motions and music. Often a motion file is tied to particular song… maybe the motion, itself, or the lip-sync enhances the music’s presentation… but OFTEN in MMD videos, the music has just about NOTHING to DO with the motions. The music has a beat… and the model motion has been created so as to have almost the same beat… and, sometimes, that’s all there is! Take a look at the Mahlazer’s “Feel the Sound”. THAT is a beautiful motion file… so nice, so smooth… and, except for a point about two-thirds-in, that motion has about nothing to DO with the song. That “point” is where the model lip-syncs “Let’s go!” and the model shimmies in a new way to accompany the music… but… try that nice motion with OTHER songs… it works just fine… just as well , really, as with it’s intended “Feel the Sound” music. Got models? Don’t hoard ’em, USE ’em! I have WAY more models in my arsenal than I have ever used. and my collection (I have 111 downloaded model folders, I just counted ’em!) would be considered as a “small” collection by most standards. 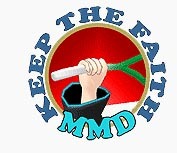 Some MMDers only DO MMD so as to collect all the models they can find! I WANT MIKUMIKUDANCE RIGHT NOW!!!!!! Patience you have, young padavan. Zeal without temperance to the Dark Side leads. Its free. Just download off the main page.